IF THE CONCEPT for Yes Man were any higher, its nose would bleed. Jim Carrey, looking a little worn out, plays Carl, a zoned-out L.A. loan officer who has a conversion experience at a human potential movement gathering. Leading the gathering is Terrence (Terence Stamp); Stamp played this guru part straight once in an inadvertently hilarious indie movie of 1997, Bliss. Deciding to say "Yes" to everything improves Carl's life immensely, getting him both a promotion and a dream girl. The film is based on British journalist Danny Wallace's account of his four months of deliberately turning his back on the most useful and noble word in the English language. This is one of the words we learn earliest. When we first say it, we're telling the world we are not helpless babies anymore and that we don't have to take what everything we're given. What's wrong with "No," anyway? Should you see this movie? Let's go with "Maybe," since director Peyton Reed is a devout studio classicist. Just as in his Down With Love, Reed shows his worship for Frank Tashlin, Jerry Lewis and the never-to-be-forgotten Don Knotts; the movie is full of leisurely two-shots of a man and a woman looking at each other, an above-average drunken fight scene and a wacky cross-town chase to wrap it all up. It's worth honoring Reed's confidence that the way to make a comedy hasn't changed in 50 years (or more). That confidence keeps this movie from jumping out of its own skin, as Carrey's films tend to do. Reed's taste makes one tend to overlook some horrifically slammed-in product placement for Warner Bros. hits 300 and the Harry Potter franchise. And they couldn't have flogged Red Bull harder. On the one hand, Yes Man has the affable Rhys Darby from The Flight of the Conchords as Carl's überdweeb supervisor. On the other hand, the renowned Fionnula Flanagan (Rose on Brotherhood) really gets dragged through it, doing the ancient bit about the horny old lady who takes out her dentures for our hero. While everyone convulsed over this wrinkly creature daring to proposition Carrey, I was thinking of Flanagan in 1985's James Joyce's Women, remembering her bravery and eroticism performing Molly Bloom's soliloquy. That is, of course, a masturbation scene, punctuated throughout with this so-so movie's favorite word. So I didn't really have the stomach to watch Flanagan being thrown to Carrey's target audience. And for that matter, the same gag was just done so much better in Soul Men. Reed should have skipped the vulgar joke. If he had kept Yes Man cleaner, he would have something more like a kid movie for aging children. 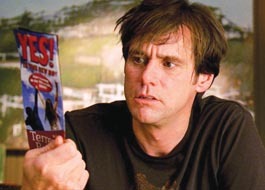 That's the point of sweet-faced Zooey Deschanel, whom Carrey keeps scooping up as if she were a doll. When you see Deschanel's sensational blue eyes you wish they still had Technicolor. Her self-assured but never arrogant style wins you over. As in real life, she's a bandleader in Yes Man, singing for a combo of goofs with Vocoders and funny-animal heads, playing to the same five people every gig. Carrey may be the lead, but Deschanel is the heart of the film. YES MAN (PG-13; 104 min. ), directed by Peyton Reed, written by Nicholas Stoller, Jarrad Paul and Andrew Mogel, based on the book by Danny Wallace, photographed by Robert D. Yeoman and starring Jim Carrey and Zooey Deschanel, opens Dec. 19.